2. 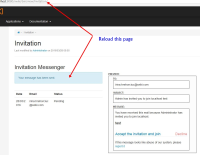 Make all the configuration for the e-mail sending and invitation application to be able to send e-mails to users. 3. Go to invitation page. Type an e-mail, title, description and click the button Invite. 4. You will get the message " Your message has been sent." 5. Reload this page with the information message multiple times. 6. Check the list of invitations. Check also the personal e-mail. The action reloading the page with the message " Your message has been sent " will create a new invitation with the same Subject, e-mail and content. Because it`s only a confirmation page, it shouldn`t create new invitations after reloading it.